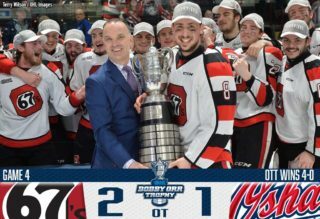 Reunited with linemate Nick Suzuki, overage veteran Kevin Hancock put up two goals and an assist in Wednesday’s 5-2 home ice win over the Sarnia Sting. Hancock potted the game winner 2:25 into the second period with assists from Suzuki and Alan Lyszczarczyk before striking on the power play just under six minutes later as Suzuki and Sean Durzi gathered helpers. Among the league’s best faceoff men, Hancock went 6-for-9 at the dot in this one and has six points (3-3–6) through his first five games of the season. 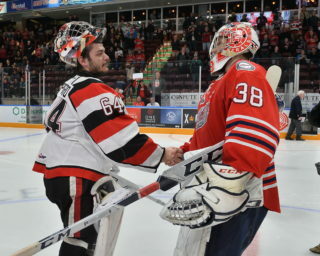 The Mississauga native recently played in his 200th OHL contest this past weekend. One of the first defencemen to make an appearance in the three star selections, North Bay Battalion blueliner David Maier jumped off the scoresheet on Wednesday. The Austrian scored his first two career OHL goals while adding an assist as the Troops defeated the Ottawa 67’s 4-3 on home ice. Maier put the Battalion ahead 3-2 with a point wrister 7:16 into the second period before scoring the power play game winner on a similar play with 6:49 left in the third. The 18-year-old was North Bay’s second round pick in the 2018 CHL Import Draft and has five points (2-3–5) in as many OHL contests. 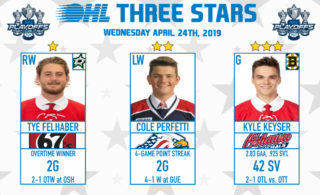 A former fourth overall OHL Draft pick, Vaughan Kings graduate Nicholas Porco is off to a tremendous start in 2018-19. 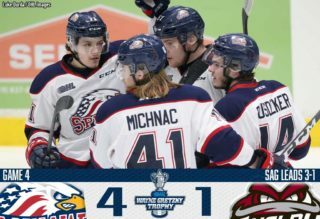 The Saginaw Spirit sophomore recorded his first multi-goal game on Wednesday, scoring twice in a 6-2 road win over the rival Flint Firebirds. He finished on a setup from linemate Cole Perfetti with 5:31 left in the opening period before netting his second shorthanded for the game winner 1:45 into the second. Porco’s five goals through five games this season are as many as he scored in 57 games as a rookie last year.